This fall, an epic new four-part series will premiere on CPTV: Native America. Made with the active participation of Native American communities and filmed in some of the most spectacular locations in the hemisphere, Native America illuminates the splendor of a past whose story has for too long remained untold. 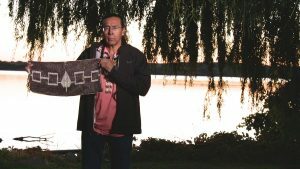 Native America will premiere on CPTV on Tuesday, October 23 at 9 p.m. Subsequent episodes will air Tuesday, October 30 at 9 p.m., and Tuesday, November 13 at 9 p.m. and 10 p.m.
Get ready for the premiere of Native America with a new series of video shorts from CPTV showcasing the history of Native American tribes and culture in Connecticut. Stream the videos below!